Oracle released an out-of-band update for its Java SE Runtime Environment software. The update contains bug fixes for Oracle Java SE. Oracle released the scheduled critical security updates for its Java SE Runtime Environment software. The update contains 32 new security fixes for Oracle Java SE. 28 of these vulnerabilities may be remotely exploitable without authentication, i.e., may be exploited over a network without requiring user credentials. Pale Moon version 27.4.0 has been released with security fixes, including DiD* patches. This is a major update to address most of the media streaming issues users have had. In addition, the update includes enhancements, bug fixes and security fixes to the browser. Relaxed some restrictions for CSP to temporarily work around web compatibility issues with the CSP-3 deprecated child-src directive. Updated elements to blank if the actively set value doesn't match any of the options. Updated the interpretation of 2-digit years in date formats to match other browsers: 0-49 = 2000-2049, 50-99 = 1950-1999. Added q units to CSS (quarter of a millimeter). Pale Moon includes both 32- and 64-bit versions for Windows, Pale Moon Portable, Pale Moon for Linux and Pale Moon for Android. The updates address Remote Code Execution, Denial of Service, Information Disclosure and Elevation of Privilege in 57 CVE's in which 19 are Critical, 35 Important, and 3 Moderate in severity. For a complete list of the CVEs addressed in the July update, see the The July 2017 Security Update Review by Dustin Childs. Adobe has released Version 26.0.0.137 of Adobe Flash Player for Microsoft Windows, Macintosh, Chrome and Linux. These updates address vulnerabilities could lead to remote code execution, information disclosure and Memory address disclosure..
"Congratulations! Thank you for your continued contributions to the Windows community, we are excited to re-award you as a Windows Insider MVP. This award is a token of our appreciation, your leadership and passion help make Windows the best yet. 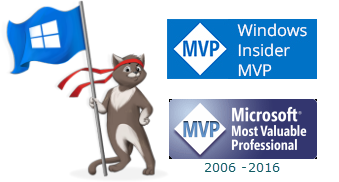 We look forward to our on-going collaboration with you and all of our Windows Insider MVPs as we continue to strengthen the Windows Insider MVP (WI MVP) Program."